Photo by George Kane. Medal of Honor Ceremony. Photo by Iris Kirkland. Medal of Honor Ceremony. Photo by Steve Kessler. 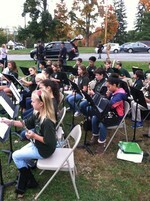 Middle School band performs at the Medal of Honor Ceremony. Photo by Steve Kessler. Middle School band. Photo by Iris Kirkland. Medal of Honor Ceremony salute. On October 18, 2014, The American Legion Post 353 held a Medal of Honor Ceremony for Cornwall's four honorees. The Legion unveiled the plaques for the honorees which are located at the new Medal of Honor Site in front of the Cornwall Town Hall. The program included several speakers, color guards, a ladder truck holding a large flag and the middle and high school bands performance of patriotic medleys.